The Best Lot and Location in Ibis! Breathtaking water & golf views are to be enjoyed from this incredibly-upgraded and newly-renovated 6,082-sq.ft. custom estate built by awarding-winning builder, Malcolm Jones. 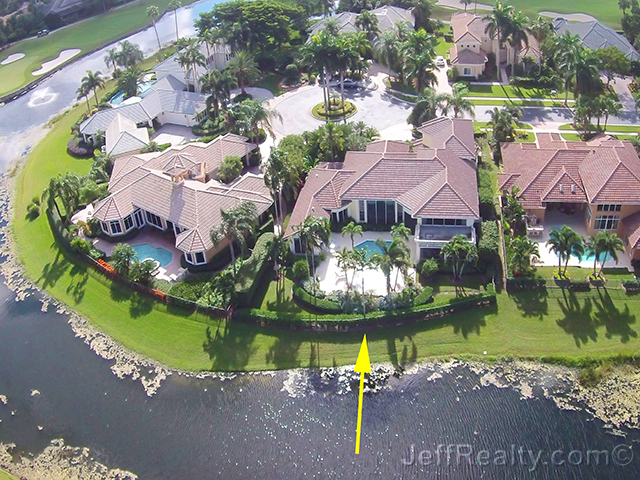 Located on a peaceful cul-de-sac at 8560 Egret Lakes Lane in Egret Lakes in Ibis Golf & Country Club, this very deep, ultra-wide lot offers unparalleled privacy with 180-degree views of rolling hill overlooking the picturesque lake on the 6th hole of the Jack Nicklaus Legend golf course. Jones designed the home to take advantage of the views from almost every room and to have an easy flow with dramatic ceilings and spacious living areas, but still keep a warm and intimate feel. Two beautiful bougainvillaea trees welcome you to this private sanctuary. When you enter the welcoming, dramatic entry of this architectural gem, with 5 bedrooms, 5 full baths, and 1 guest bath, you stop and try to absorb the absolute beauty of the view and you immediately know this place is home. Be it the soaring, double-tray ceilings, unique octagonal dining area, or granite, sunken, multi-seat wet-bar, you immediately appreciate the great flow of the superb entertaining layout. The kitchen was remodeled in 2014 and is a showpiece. One of world’s most expensive, unique, and brilliant granites you’ve ever seen is used generously on the counters, backsplash, desk, island, and breakfast counter. 2015 in-vogue white-glazed and French cabinets and top-of-the-line stainless steel appliances are perfect to cook and for social gatherings. Waking up in the 1500-sq.ft. master suite with double coffered ceilings, incredible views, 2 full baths, a giant walk-in closet, and an additional private den/bedroom, makes for the beginning of a great day. Right beside the master is a private, etched-glass enclosed office. 4 additional VIP guest suites will keep your visitors delighted. The outdoors is why you live in Florida! A huge open patio with a free-form heated pool & spa, along with a covered and screened lanai allows you to marvel at the surroundings in complete privacy. Beyond having a magnificent lake and golf course view, with no golf cart path behind the property, what makes this house and lot the best location in Ibis is the close proximity to the front gate, clubhouse, and the new state-of-the-art sports village complex and new clubhouse. Ibis is a well-managed luxury community that offers great value (Community of the year in both 2012 and 2013); a unique combination of luxury and beauty without outrageous home prices and without sky high country club initiation or dues. Extras…$50,000 New Turner Roof 2014, $50,000 New Kitchen 2014, 3 new HVAC units 2010, 2 water heaters, LED lights, hurricane windows, insulated attic, and a New Pool Heater 2014. Posted in Ibis, Ibis homes, Ibis homes for sale on November 20, 2014 at 8:17 am. Time to look for a vacation rental in Florida!